Just seeing the bottle reminds me of being in Greece and it’s funny how this salt makes everything taste a little more Greek to me. Yes, I know salt doesn’t have a flavor but this is really a salt above the rest. It’s a very pure, fine sea salt and I sprinkle it on not just savory but sweet foods as well. Try it on grapefruit, no joke it take the bitterness out and leaves just the citrussy sweetness on your tongue. Perfect for cooking and baked goods too. 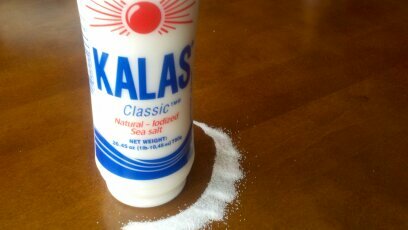 Bonus – unlike other sea salts, Kalas can be used in any regular salt shaker! Find it online at http://parthenonfoods.com/salt-fine-kalas-141oz-p-1622.html .